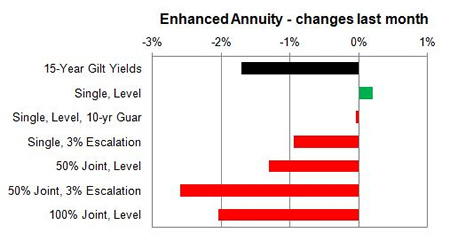 As gilt yields continue to reduce ahead of uncertainty over the Brexit vote, annuity rates from providers fall to new lows despite the Federal Reserve hint they may increase US interest rates. The 15-year gilt yields were lower by 17 basis points for the month as the EU Referendum is now in focus. With the risk of a Brexit vote investors have been seeking safe havens such as bonds and gilts sending prices higher and yields lower. Standard providers decreased rates by 1.53% and we would expect in the short term rates may rise by 2.93%. For smoker and enhanced annuity providers decreased their rates by 0.77% on average and in the short term rates may rise by 2.17%. The majority of rates increased with 4% rising, 26% remaining unchanged and 70% decreasing. 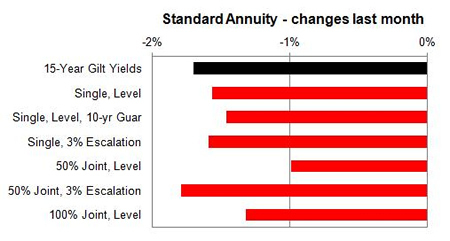 Standard annuities decreased by an average of 1.47% during the month with a larger decrease of up to 4.1%% for those aged 55-60 buying single life 3% escalating annuities. For enhanced and smoker providers rates most decreased by an average of 1.45% with a larger decrease of up to 6.6% for those aged 55-60 buying 50% joint life 3% escalating annuities. 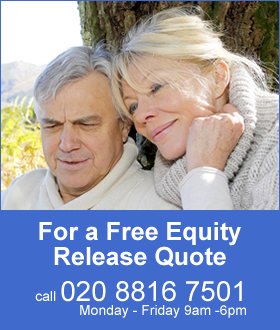 Only for those aged 65-70 on a single life on a level basis received up to a 2.0% rise in rates.